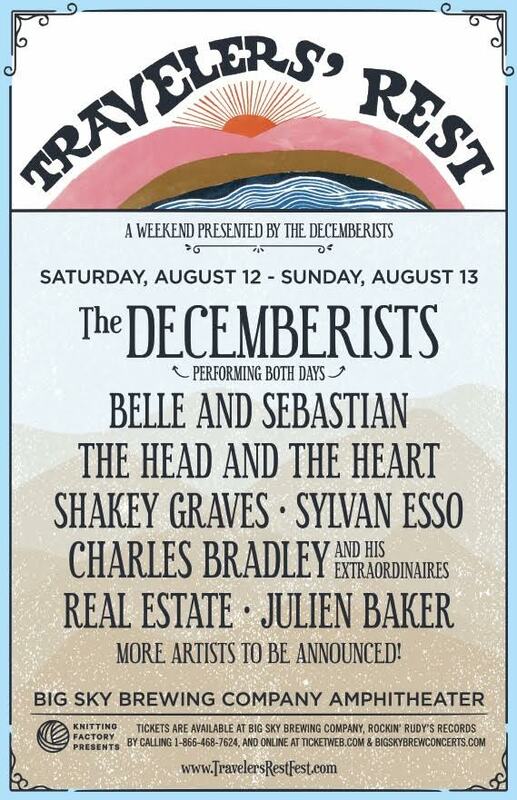 Decemberists to headline new music fest! Knitting Factory Presents and Trail 103.3 are excited to announce the inaugural presentation of Travelers’ Rest, a two-day curated music festival featuring The Decemberists and many more LIVE at the Big Sky Brewing Company in Missoula, Montana! Line-up for the festival on August 12 and 13, 2017, also includes Belle and Sebastian, The Head and the Heart, Sylvan Esso, Shakey Graves, Charles Bradley and His Extraordinaires, Real Estate and Julien Baker. 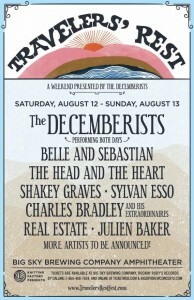 In total, more than 15 bands and artists will perform on two stages at the festival, with The Decemberists headlining both days with two unique sets. Additional artists will be announced later this spring. Weekend passes go on sale this Friday, March 24th at 10 am at bigskybrewconcerts.com. Cost is $79.50, with a VIP weekend pass option available for $149.50. Tickets are also available at Big Sky Brewing Company, Rockin’ Rudy’s or by calling 866-468-7624. A portion of each ticket sold will benefit ACLU Montana, and the band plans to use the festival to shine a spotlight on several other progressive-minded organizations working in Montana. For more details, visit travelersrestfest.com.